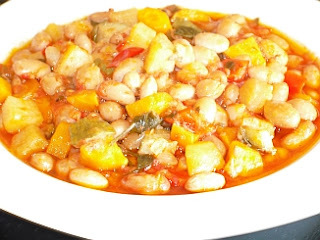 Handres (Pinto Beans or alternatively Cranberry Beans) are very popular in Greece. This is a way of preparing them in a covered clay oven dish, called a dava, in the oven. You should use fresh beans, which you remove from their pods. The clay dish needs to have a well-fitting cover, allowing no air gaps. A tasty and nutritious dish, also suitable for vegetarians and vegans - and very simple to prepare! Put all the ingredients into a clay oven dish. Cover the dish well and put in a pre heated oven at 150 degrees Celsius for approx. 2 hours, until there is just a little liquid left. Thanks so much for your share. We moved to Florida from Ohio in 2005 and I discovered these beans not much later and have prepared them several times but I've been trying since to identify them. Are they pintos or cranberry beans? Thanks to you I now know they are both! No wonder I was confused! Thanks again and again!